We provide Interiors Services such as Office Chairs Service, Office Furnitures Service, Kitchen Cabinet, Modular Kitchen, Home Interior, Loft and Wall Cupboards and many more items from India. Type of Property Covered Residential And Commercial . Get amazing range of false ceiling, suspended ceiling, pop work, dropped ceiling in india with vast design options. 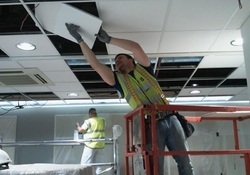 We specialize in offering simple ceiling designs which are elegant and aesthetically appealing.